Tantibundhit, Charturong Onsuwan, Chutamanee Munthuli, Adirek Sirimujalin, Ploypailin Anansiripinyo, Thanaporn Phuechpanpaisal, Sutanya Wright, Nida and Kosawat, Krit 2018. Development of a Thai phonetically balanced monosyllabic word recognition test: Derivation of phoneme distribution, word list construction, and response evaluations. Speech Communication, Vol. 103, Issue. , p. 1. Koenig, Laura L. and Whalen, D. H. 2018. In Memoriam: Arthur S. Abramson (1925–2017). Journal of the International Phonetic Association, Vol. 48, Issue. 02, p. 257. Tantibundhit, Charturong and Onsuwan, Chutamanee 2015. Speech intelligibility tests and analysis of confusions and perceptual representations of Thai initial consonants. Speech Communication, Vol. 72, Issue. , p. 109. Prom-on, Santitham Birkholz, Peter and Xu, Yi 2014. Estimating vocal tract shapes of Thai vowels from contextual vowel variation. p. 1. Gandour, Jackson T. 2013. A functional deficit in the sensorimotor interface component as revealed by oral reading in Thai conduction aphasia. Journal of Neurolinguistics, Vol. 26, Issue. 3, p. 337. Chotimongkol, Ananlada Thatphithakkul, Sumonmas Chootrakool, Patcharika Hansakunbuntheung, Chatchawarn and Wutiwiwatchai, Chai 2011. The design and development of PELECAN: Pronunciation Errors from Learners of English Corpus and Annotation. p. 36. Tsukada, Kimiko and Nguyn, Thu T. A. 2010. Identification of Vietnamese Final Stops: Northern Dialect Speakers' Perception of Native and Non-Native Stops. Asia Pacific Journal of Speech, Language and Hearing, Vol. 13, Issue. 4, p. 201. Tsukada, Kimiko 2009. Durational Characteristics of English Vowels Produced by Japanese and Thai Second Language (L2) Learners. Australian Journal of Linguistics, Vol. 29, Issue. 2, p. 287. Tsukada, Kimiko and Roengpitya, Rungpat 2008. Discrimination of English and Thai words ending with voiceless stops by native Thai listeners differing in English experience. Journal of the International Phonetic Association, Vol. 38, Issue. 03, p. 325. Tsukada, Kimiko 2007. Cross-Language Perception of Word-Final Stops by Multilingual Listeners: Preliminary Results on the Effect of Listeners' First Language (L1) Backgrounds. Asia Pacific Journal of Speech, Language and Hearing, Vol. 10, Issue. 1, p. 1. Xu, Yisheng Gandour, Jackson Talavage, Thomas Wong, Donald Dzemidzic, Mario Tong, Yunxia Li, Xiaojian and Lowe, Mark 2006. Activation of the left planum temporale in pitch processing is shaped by language experience. Human Brain Mapping, Vol. 27, Issue. 2, p. 173. Gandour, Jack Tumtavitikul, Apiluck and Satthamnuwong, Nakarin 2002. Effects of speaking rate on the Thai emphatic tone. Asia Pacific Journal of Speech, Language and Hearing, Vol. 7, Issue. 2, p. 101. Gandour, Jack Wong, Donald Lowe, Mark Dzemidzic, Mario Satthamnuwong, Nakarin Tong, Yunxia and Li, Xiaojian 2002. A Cross-Linguistic fMRI Study of Spectral and Temporal Cues Underlying Phonological Processing. Journal of Cognitive Neuroscience, Vol. 14, Issue. 7, p. 1076. Durie, Mark and Hajek, John 1995. Getting it right: More on an orthography for Australian English. Australian Journal of Linguistics, Vol. 15, Issue. 2, p. 227. Haskins Laboratories, New Haven, CT and Department of Linguistics, The University of Connecticut, Storrs, CT 06269-1145, U.S.A.
Abramson, A. S. (1962). 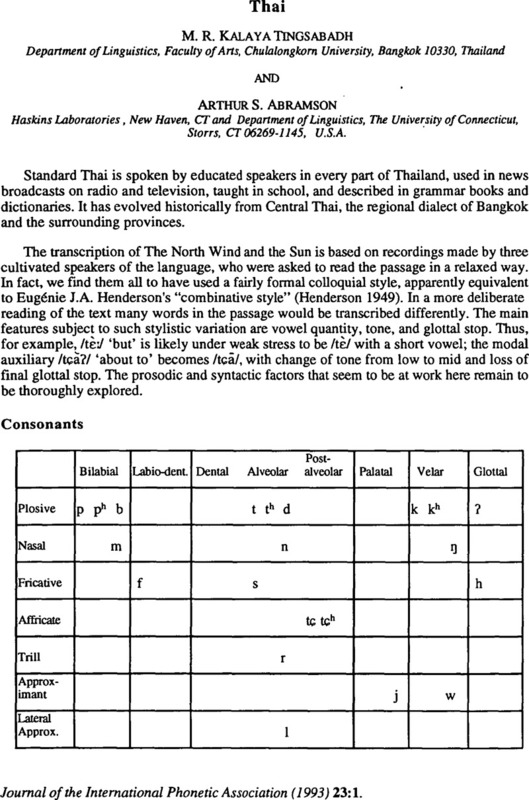 The Vowels and Tones of Standard Thai: Acoustical Measurements and Experiments. Bloomington: Indiana University Research Center in Anthropology, Folklore, and Linguistics, Publication 20. Abramson, A. S. (1989). Laryngeal control in the plosives of Standard Thai. Pasaa 19, 85–93. Abramson, A. S. and Ren, N. (1990). Distinctive vowel length: Duration vs. spectrum in Thai. Journal of Phonetics 18, 79–92. Harris, J. G. (1972). Phonetic notes on some Siamese consonants. In Harris, J.G. and Noss, R.B. (editors), Tai Phonetics and Phonology, 8–22. Bangkok: Central Institute of English Language. Henderson, E. J. A. (1949). Prosodies in Siamese: A study in synthesis. Asia Major New Series 1, 189–215. Henderson, E. J. A. (1964). Marginalia to Siamese phonetic studies. In Abercrombie, D., Fry, D.B., MacCarthy, P.A.D., Scott, N.C., and Trim, J.L.M. (editors), In Honour of Daniel Jones: Papers Contributed on the Occasion of his Eightieth Birthday 12 September 1961, 415–424. London: Longmans.